P.S. : Thanks, Kirk, for the correction! That's an absolutely stunning weapon. Love it, the detailing is great. I love the aesthetics provided by the combination of blade and guard (love that blade Howy) and I even like that ring pommel, which I normally hate. I know one person who's going to be thrilled with this and he'd better let me play with it! The blade is also impressive and interesting that it is going to be used for a few different swords. Where's mine? Is it here yet? huh, huh? No doubt about it, that is one sword that gets better looking every time I see it! Soooooo glad I went with this one. Can't wait!!!!!!!!! PK - well, since you let me play with your baby "Svante", I suppose you can play with mine when it comes. Thanks Howy for just making them better and better. Don't normally like ring hilts, but that one looks nice. Another beauty from Albion! I like it. 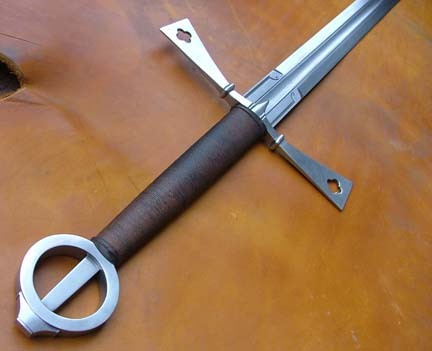 WOW...I don't normally like ring hilts, but, wow...I do like this one! I love that blade. I can't wait to see the shorter version on the Condottierre and the Doge! Such sweet torment! I absolutely love it; great job guys! I'm very eager to see the Condotierre and the compound-hilted longswords featuring the longer blade. WOW! This is gorgeous. The detail on the cross is really nice as is the ring. Great job! Awesome job guys, awesome job; can't wait to see the Kern. I never gush over new swords. I don't really like ring hilts. I am forced to break both traditions. This is a beautiful sword, it's just awesome... the blade is stunning, the ring looks stout and well executed, the gaurd is just magnificent. Yes, this turned out superb. Though, I'm ringhilt biased. What amazes me is that this sword is only a little over 2.5 lbs! That's super light for a sword of these proportions. Mike and I may eventually need to have a talk about this fella! I am impressed, I was momentarily taken aback by how it substantially exceeded my expectations. For such an attractive blade a limited edition of 100 suddenly seems small. Anyway, congrats, this one turned out very nice.